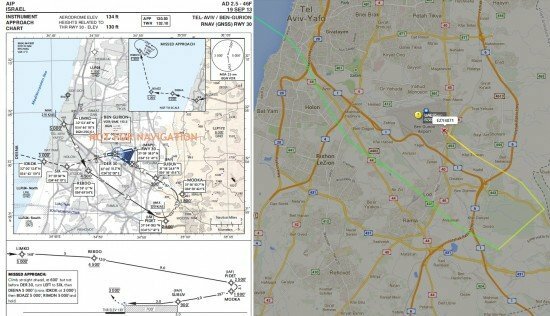 The Israeli Transportation Ministry is investigating several recurring cases in which aircraft deviated from their approved altitude and approach path towards Tel Aviv’s Ben Gurion Airport. The most recent of seven occurrences was on March 4 when easyJet flight U2-4871 from Rome, Italy, descended to an altitude of 4500 feet, while it was cleared for 5000 feet. The Airbus A319 was flying an instrument approach rather than a visual approach, according to information published by Haaretz. Data from flight tracking website Flightradar24 show the flight on an approach to runway 30 via the LIMKO, REBDO, and PIDET waypoints. The visual approach procedure for Tel Aviv (LLBG), as expected by the controller, calls for 5,000 feet over LIMKO and REBDO, followed by a descent to 2,500 feet over PIDET. The instrument approach calls for an altitude of 4,500 feet over REBDO. Similar occurrences happened for example on February 4 when an Alitalia passenger plane, a Boeing 777 crossed the coast line at 4,300 feet instead of 4,500 feet. This was the crew’s first flight to Ben-Gurion. In addition, the crew deviated to the southeast from their assigned approach path. Another incident occurred on February 19, when an Aeroflot passenger plane, an Airbus A321, crossed the coastline at 4,200 feet, some 300 feet lower than the controller’s instructions.